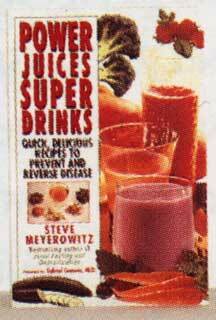 Power Juices Super Drinks: Quick, Delicious Recipes to Prevent and Reverse Disease. Juices, teas, milks made from soy, rice, or nuts, and other drinks are a great way to get the vital nourishment we need to help prevent and fight disease. Now you can learn how to tap the healing power of natural fruits, vegetables, herbs, and seeds for such conditions as: Memory Loss, Asthma, Chronic Fatigue, Excess Weight, Depression, Periodontal Disease, Anemia, Enlarged Prostate, Sexual Dysfunction, Cancer, Skin Problems, and Flu. With hundreds of quick and delicious recipes, this handy guide makes juicing fast and easy enough to fit into any lifestyle. For renewed health and glowing vitality, pick up Power Juices, Super Drinks today! 413 pages.